When Google crawls a page on your website, it also looks at your overall website architecture. It looks for a clear hierarchy of pages that are clearly defined into categories and sub-topics. As a website owner, you need to strive for a good website organizational structure for better SEO. Not only does it makes it easier for Google to crawl your website, but it also helps improve the user experience. One of the fundamentals of website structure is internal linking. For SEO beginners who are unfamiliar with the concept, here is a quick explanation of internal links. Internal links connect different web pages from a single website. It is critical because it can redirect users from a specific webpage to other related pages. This can directly influence a website’s SEO by increasing your engagement rate. Internal linking can also increase the time that users spend on your website and the number of pages they view per session. It’s a clever way of climbing up to the top of the Search Engine Results Pages (SERPs) and boosting your website traffic. Here are 5 ways to optimize a website using internal links. Whenever you’re placing internal links into a webpage, try to see it from the perspective of a reader. Does it provide more value to the audience? Does it seem natural or is it forced? A well-written piece of content weaves in relevant links effortlessly. Internal links need to be relevant to the overall content of the webpage. So, how do you ensure that your internal links are topical? For example, let’s say you’re writing an article about dogs. 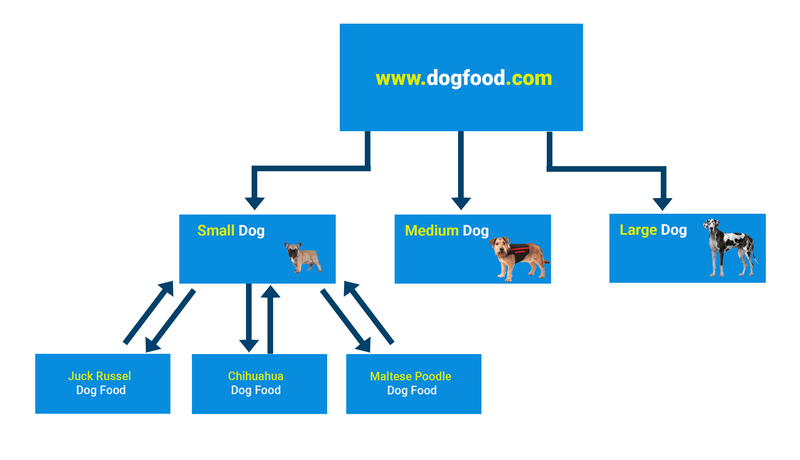 Linking to other articles about various types of dogs, kennels, or dog food is logical. However, adding a link to an article about rabbit hutches may not an appropriate choice. Even though rabbits and dogs are both related to the sub-topic of pets, they are not directly related. For internal linking, you need to establish a direct connection that is easier for users to understand. So it might be a better idea to mention rabbit hutches in your article that talks about rabbits. Out of desperation, a lot of webmasters tend to cram up their webpages with internal links. But that’s not what Google recommends. According to their technical guidelines, all webpages should have a reasonable number of links. But then, what really is a reasonable number for Google? There is no clear answer to this question. Google says that, at most, a thousand links are acceptable. But that includes the total number of HREFs on your webpage. Everything from header to ads is a part of it. When you consider only internal linking, the number of links is dependent on the length of the article. For a post that is around 1500 words long, two to three internal links should be good enough. But don’t just link for the sake of linking. The aim of linking should be to create a better organizational structure. So, fewer links are all right. But make sure that they are all relevant. The process of internal linking does not stop with only adding relevant links to your webpages. If you really want to optimize your website, you need to constantly keep a tab on broken links.These broken links could be internal as well external links. Either way, they could damage your website’s SEO. For users visiting your website, it can be a terrible user experience. If an internal link is broken, they are likely to see a 404 error on their screen. There could be two explanations for this. One of them is that the webpage that is used as an internal link was deleted. Or its URL could have changed without proper redirects in place. To make your website more user-friendly, you need to remove broken links. The best way to keep track of your broken links is to constantly audit your links using the rank tracking tools like Pro Rank Tracker. When you add a hyperlink to any text, you make it a clickable link on your webpage. The words in the content that are used for hyperlinking are known as anchor text. While using internal links, it is important to optimize your anchor text. Search engines use anchor text to understand how others view your page. You can make sure that you are making your web page more relevant to others by using the right anchor text. This can even improve your chances of ranking well. Anchor text is like a hook that tells that reader where they can find more information related to the content they are reading. For example, if your article is about photography, you could link to related articles about cameras. By doing so, you can redirect users who are interested in cameras to another topic of their interest. The word “camera” or phrases like “best cameras to buy” or “cameras for beginners” could make good anchor text. That’s because it adds value to the content and is directly related to the topic as well. But instead, if you use words like “click here” or “check this out,” you are not providing any context. So, it is best to avoid linking with such generic phrases. While it is a good idea to link with keywords or different variations of it, be wary of overdoing it. After the Penguin algorithm update, Google has been paying more attention to keywords in anchor text. If your website has too many links for the same anchor text, it raises suspicion. So, make sure you are balancing keywords with topical relevance while choosing anchor text phrases. A lot of webmasters make the mistake of using only their homepage in internal linking. This can help you build page authority. But if you want more of your blog posts to rank higher in the SERPs, you need to use the deep linking technique. Deep linking refers to the linking of internal pages of your website. In this technique, you look beyond the home page or other page categories that are already easily accessible to the reader. One of the reasons why deep linking is useful is that it allows you to make your old content reusable. Deep linking also ensures that your authority is spread more uniformly. Instead of ranking for only a for a few keywords, you are diversifying your keyword basket. With deep linking, you can boost the visibility and page rankings of multiple webpages. For webmasters looking to optimize their websites, it is important to learn how to do internal linking. It can boost your SEO strategy and also make your website more organized and user-friendly. For internal links to work effectively, you need to choose them carefully. Also, they need to be topical and be placed naturally in the flow of your content. The concept of internal linking may sound a little overwhelming for those who are just getting started with SEO. But it’s really not hard once you understand how internal links work. In which other ways can you optimize your website using internal links? Please share your suggestions in the comments section. Renu Sharma is an Inbound Marketing Manager at Attrock. She is very passionate about work and has been working with lot of reputed brands to increase their online visibility.